On a map, Trieste might look as though it has been stuffed unceremoniously down into a slither of excess land that drapes itself along the very top of the east Adriatic coast. With the sea on one side and the Slovene border a stone’s throw away on two others, Trieste has all the hallmarks of being a forgotten backwater, and even the hagiographic local tourist office material refers to it as being “forlorn in a corner of the Italian territory”. The inhabitants generally, however, prefer to think of the town as a bridge or crossroads. And the very attributes that make it an isolated corner make it thrust into the heart of central Europe. The Slovene capital is but an hour’s drive away, Croatia is even nearer, and Trieste—and especially the thin strip of countryside between it and the border—has a significant Slovene population. As with any self-respecting central European town, the borders have swung backwards and forwards across it more times than people care to remember. Although the Festival was started with the intention of promoting “Alpe Adria Cinema”—films from Switzerland, Austria, Italy and Yugoslavia—the remit has evolved and it is now known primarily for its programming of films from all the former communist countries. For all that there is meant to be an “Adria” component to the Festival, this year southeast Europe came off particularly badly. There were no feature-length films from Slovenia, Croatia, Bosnia or Macedonia and only one from Serbia, Srđan Golubović’s gripping Apsolutnih sto (Absolute Hundred, 2001). There was nothing from Bulgaria, while Albania and Romania were represented by one film apiece, the omnipresent Slogans (2001) by Gjergj Xhuvani and Cristi Puiu’s Barfa şi banii (Stuff and Dough, 2001) respectively. Given that both these films showed at two of Europe’s most important film events—the Directors’ Fortnight at Cannes and Karlovy Vary—the spirit of adventure and discovery you would expect from a highly specialised festival such as this was largely absent as far as the Balkans were concerned. Still, southeast Europe’s loss was to be Poland’s gain. In competition was Robert Gliński’s Cześć Tereska (Hi, Tereska, 2000), which won at Karlovy Vary. Although a fiction film, it explores the very real and headline-grabbing phenomenon of teenage murderers. 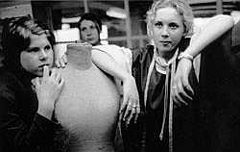 Gliński’s film is far from sensationalist however, shot in austere black and white on digital video and with an almost ethnographic interest in teenage slang (it has jokingly been suggested that there should be Polish subtitles even for the film’s domestic audience). Much of the film’s success is due to the presence of teenage lead actress Aleksandra Gietner, a non-professional actor who Gliński found in a borstal. Apparently, her behaviour did not change in any way for the better while she was on set, and Gliński, in a moving introduction to the Festival’s screening, described Gietner’s regret at not being able to attend the screening, as she was at the time locked up in a Polish jail. In this regret, Gliński saw hope that she might change her ways and be free to attend future screenings abroad. The jury obviously warmed to this unusual idea of international film success as behavioural therapy and awarded Gietner a special mention. The retrospective this year was devoted to octogenarian Jerzy Kawalerowicz, the Cecil B De Mille of Polish cinema. His latest film, Quo vadis (2001), is one of a string of recent Polish blockbusters based on classics novels, this time the literary source being Nobel Laureate Henryk Sienkiewicz’s book of the same name. Despite a distinguished career—the director made such classics as Matka Joanna od Aniołów (Mother Joan of the Angels, 1960) and Śmierć Prezydenta (Death of the President, 1977) and sits alongside the names of Andrzej Wajda and Andrzej Munk as the founders of modern Polish cinema—this is the first retrospective of Kawalerowicz’s work to be held. A regular feature of Trieste is its focus on film schools. This year, the spotlight was on Wydział Radia i Telewizja im. Krzysztofa Kieślowskego, more commonly known as the Katowice film school. The school, actually a faculty of the University of Silesia, is particularly known for the courses in directing, thanks to the presence of a number of distinguished teachers, including Krzysztof Zanussi, Jerzy Stuhr, Filip Bajon and Wojciech Marczewski. Stuhr (who is something of a star in Italy) was present to introduce some of the most recent graduation work of the school. As Stuhr explained to me after, teaching is not just a one-way process for him. His next project will use a recent graduate Marcin Wrona (whose 20-minute short Człowiek magnes [Magnet Man, 2001] was presented) as assistant director and the screenplay was developed with another of his students. For fans of Russian cinema, there were several must-sees. 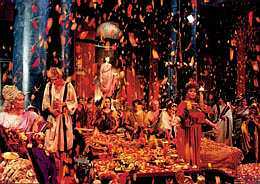 Firstly, there was another chance to see Artur Aristakisian’s Mesto na zemle (A Place on Earth, 2001), which has received both the Freedom Prize at Karlovy Vary and much critical flak from reviewers who have generally been dismayed at its portrayal of Moscow’s hippies and down-and-outs. At festival screenings everywhere, walkout rates have been high, particularly when the main protagonist castrates himself (which, I should stress, is not seen). Aristakisian insists that the film has failed because it refuses to pander to the conventional tastes of film-goers. Love it or hate it, though, it is worth watching for the flashes of genius that are clearly visible in an otherwise confusing and, perhaps, confused film. Another high-profile Russian auteur is Aleksandr Sokurov, who currently is much in favour with international critics. However, for all that, his Elegiia dorogi (Elegy of a Voyage, 2001) is likely to be overlooked by critics. 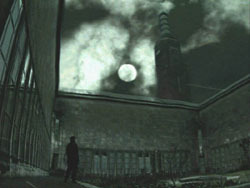 Firstly, it is categorised as a documentary (always a good way to keep audiences away) and secondly it is sandwiched in Sokurov’s production CV between two films which make far more eye-catching copy for journalists—Telets (Taurus, 2001), which shocked hardline lefties with its depiction of Lenin slowly slipping into dementia, and the Martin Scorsese-backed “Waterloo—The Russian Ark,” a mind-blowingly ambitious project, reported to be a history of Russia shot in St Petersburg’s Hermitage in one 90-minute take with a cast of thousands all in period costume. Elegiia dorogi, which belongs to a whole series of “elegies” Sokurov has filmed throughout his career, is a far more modest work. But it’s one that shouldn’t be ignored either, showing as it does the director at his full poetic power. For something more plot-driven, though, you are better off turning to Sestry (Sisters, 2001) the debut directing effort from Sergei Bodrov Jnr. Bodrov Jnr made his name as an actor, first of all in his father’s Kavkazskii plennik (Prisoner of the Mountains, 1996) and then in Aleksei Balabanov’s Russian mafia flicks Brat (Brother, 1997) and its sequel (2000). It’s clearly Balabanov’s directorial style Bodrov’s been influenced by in this film, though, to the extent that the film seems like pastiche. Even the title seems uncannily derivative. However, it has to be said that for all you may question the film’s deep artistic values and the director’s own embarrassing, self-parodying cameo performance, Bodrov really isn’t all that bad working behind the camera. The film is reasonably paced, has superb child performances and on the whole is more coherent than the films by Balabanov which influenced Bodrov so heavily. Be warned, as well, that a sizeable quantity of the films and events, particularly on the otherwise attractive sidebar features, are only translated into Italian. However, if you do speak the lingo and you want to catch up on central and southeast European films, Trieste is certainly the most relaxed way to do it. The Festival is totally ticketless, with only two venues there isn’t much frantic running around to do and there are almost no screenings during the daytime on weekdays. More experienced festival-goers may well find themselves slightly disorientated that they are actually getting a full night’s sleep without missing anything. The reason for this is that Trieste is not really an international film festival in the usual sense of the term, more a local event for the benefit of mostly local audiences. Italian premieres abound, but for international festival-goers the competition selection seemed a little too predictable. This is not entirely the Festival’s fault, though, and some might consider it scandalous if the Festival did not showcase to Italians the region’s most internationally successful films. But in a world that is paying increasing attention to central and southeast European film, I find myself wondering, is it getting harder for small festivals to programme interesting new discoveries from the region when the bigger festivals are promptly scooping them up?